Delicious Recipe from Hired Hands Homecare! Heat olive oil in a large pot over medium heat, add carrots, celery and onion and saute 3 – 4 minutes. Add garlic and saute 30 seconds longer. Stir in chicken broth, Italian seasoning and season with salt and pepper to taste. Bring to a boil over medium-high heat then cover and boil 5 minutes. Add tortellini and place parsley in a mound submerged into broth on top of tortellini, cover and boil 6 – 8 minutes longer (or one minute less than time listed on package). Using tongs, remove parsley (I stirred it around in the soup first just to get all the flavor out). Stir in chicken and cook until heated through, about 1 minute. Serve warm, topped with chopped fresh parsley leaves. 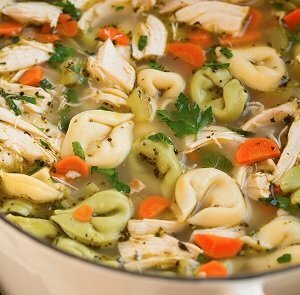 *If you don’t want to buy the larger package of tortellini you can use a 9 oz package and reduce the chicken broth to 3 (14.5 oz) cans and chicken to 2 cups (which will give you about 4 servings). Right before serving, add a large bunch of fresh spinach, stir into soup, and let cook for another couple of minutes. Even more healthy! For a little spice, add crushed red pepper while soup simmers. For a creamier version, add 8 oz. heavy cream.